Ever get burned when someone has added a layer on one of your XEFs and did not tell you about it? It shows up on your plot and either you have to plot again, or you don’t notice and it goes out to the client! 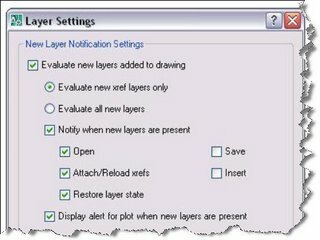 Now you can set AutoCAD 2008 so that it will notify you when when this happens. It basically takes a snapshot of your layers when you SAVE or PLOT your file. Then compares that to the new layers that may appear. Several options are available to use for when this check is done. See the dialog box clip above. This may be worth the upgrade price for some of you.